Cormount (also known as Archen Cormount or just Archen during the late Third Era) is a city in central Valenwood, located north of Elden Root and south of Silvenar, in the Grahtwood region. Cormount's quiet surroundings and distance from the Wood Elf seat of power in Falinesti made it an ideal hideaway, especially for the Camoran factions. Over the years of the First Era, the cream of the Bosmer nobility took lovers in Cormount, who gave birth to numerous and anonymous Camoran illegitimate sons and daughters. By this time, a cadet branch of the royal Camoran Dynasty, the Gorinir, made this town their stronghold in Valenwood. In 1E 2714, the small town, along with the rest of Valenwood was conquered by the Second Empire, after centuries of unrelenting warfare along the border with Cyrodiil and a plague from Thras. Although the province became occupied by the Imperial Legion, they continued to experienced resistance from some natives for several years. 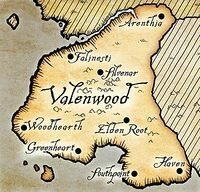 During the Second Empire rule of Valenwood, each of the treethanes of Falinesti, Silvenar, Haven, Cormount, Elden Root, and Woodhearth were given a minor kingdom, rising from local to regional powers. This way, Valenwood was divided into six independent kingdoms ruled by local Bosmer nobility, but under the Second Empire banner and protection. During this time, Cormount treethanes ruled one of those kingdoms, which extended along the northeastern border with Elsweyr. The once tiny town grew from a simple trading post into a major city. In 2E 406, a scandal rocked the Camoran factions when it was revealed that Cormount might be the source of dozens upon dozens of potential heirs, most of whom were of marriageable age. Cormount nearly doubled its population in one week as opportunists, the curious, and the cunning arrived in town. For months thereafter, weddings were a daily occurrence. This rumor also drew many young Wood Elves who lived outside of Valenwood. They came to the thriving town with their Imperial fortunes, founding a ramshackle village near Cormount called New Joy. The settlers were known as "migrants" by the Green Pact Bosmer who were shocked by the Cyrodiilic customs of New Joy inhabitants. Meanwhile, the migrants flaunted the "backwoods" nature of the natives, seeking easy pleasures in the trade that flowed through Cormount. In 2E 420, tensions between Cormount and New Joy grew to a boiling point. It is unknown who cast the first torch, but one dark night the settlement of New Joy was burned to the ground. Those who fled were slain. Though none took credit for this massacre, it was widely assumed the work of Green Pact adherents of Cormount. In the few short years before the end of the Long Truce, Camorans looking to air their grievances frequently used the Razing of New Joy as a political cudgel. In 2E 489, the Blacksap Movement, a political and religious-motivated faction, was founded in the town and supported by the Gorinir ruling family, who wanted to strengthen the Green Pact among Bosmer and legitimize themselves as the rightful Camoran overlords of Valenwood. When Aeradan Camoran began his unification of Valenwood in 2E 580, some people disagreed with his certain decisions, in particular the one exempting his Vinedusk Rangers from the Green Pact. Because of this, the Blacksap Movement became strongly opposed to Aeradan's rule, and it did not take long before the movement reformed into a rebellion. It was led by Gelthior Camoran, a cousin to Aeradan, who rebelled against Elden Root Camorans and crowned himself King of Valenwood. However, Queen Ayrenn of the Summerset Isles allied with Aeradan and the Blacksap Rebellion was put down by their combined forces. During the final battle, the Jade Dragoons, an elite Altmer unit under the command of General Endare, seized the town and killed most of Blacksap supporters during the so-called "Massacre at Cormount". Meanwhile, the Vinedusk Rangers secretly captured Gelthior, who was presumed killed in the battle. His two sons, Lorchon and Gorinir, fled and began to reorganize their forces. The Jade Dragoons became known across Valenwood for their military victory, which became a friction point between Aeradan and the Blacksap supporters. 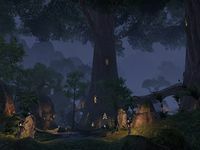 Cormount continued to be the principal base of dissidence against Aeradan Camoran, especially after the town was incorporated into the First Aldmeri Dominion along with the rest of Camoran-controlled Valenwood. However, the Gorinir family lost its holdings in Cormount and soon Iirdel, a new treethane loyal to the King and to the Dominion, rose to rule the settlement. In 2E 582, the Vinedusk Rangers, aided by the Soulless One, captured the sons of Gelthior and ended the Blacksap dissidence in Cormount. The city was then surrounded by Dominion forces, and the last remnants of the rebels were defeated. The town remained in Aldmeri hands until the eventual dissolution of the Dominion. In 2E 830, the city was annexed by the Second Aldmeri Dominion after the intervention of Summerset in another Camoran civil war. However, the catastrophic use of the Numidium by Tiber Septim resulted in the conquest of both the entire of Valenwood and the Summerset Isles in 2E 896, ending the Second Aldmeri Dominion control of the settlement, which was incorporated to the Third Empire. Since the beginning of the Third Era, Cormount became part of the Province of Valenwood. However, the once major city was nothing more than a small settlement, dwarfed by neighboring Elden Root. The town remained in Imperial hands except for the Camoran Usurper Rebellion between 3E 249 and 3E 267. During the Imperial Simulacrum, the village of Archen Cormount was an active settlement, being ruled by Lord Palitan. It had a rivalry with Tarlain Heights and Meadow Run. The Oblivion Crisis that ended the Third Era and weakened the Empire provided the opportunity for the Thalmor to seized the Summerset Isles. In 4E 29, a Thalmor-backed coup overthrew Valenwood's government, routing Imperial forces and their Bosmer supporters. Alinor and Valenwood then proclaimed a union, and a new Aldmeri Dominion was formed. The city fell into Aldmeri hands for the third time in history. Brewers in Cormount are well-known across Valenwood for their rotmeth. This alcoholic beverage is made from fermented meat seasoned with thunderbug organs, takes years to brew, and is considered a precious ritual beverage that symbolizes "the muscle of the boar, the power of the forest, the strength of the Bosmer people". No Bosmer wedding can take place without it. During mid-Second Era, Green Leaf Brewers sold the well-priced "Old Repugnant" rotmeth variety. This page was last modified on 26 February 2019, at 17:07.